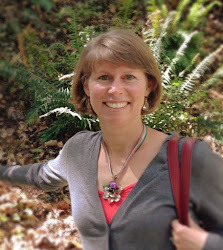 This week I'm featuring my friend and business partner Annabel Heinemann for Photo Friday. The Heinemanns vacation in Baja at least once a year, meeting up with various families for a windsurfing extravaganza at a beach town called Los Barriles, which is an hour north of Cabo on the Sea of Cortez. Most of the friends they meet are camping for several months, so Annabel is a quickie with a mere 3-week stay. Needless to say, her family comes back tan, relaxed and happy. And isn't that what traveling is all about? Campsite powered by rooftop solar panels. The solar powered campers a great idea! Looks like a good spot to hang out for awhile. I've been down to this area myself. Seems the weather is always great (especially when compared with Seattle!). I, too, love the solar panels. A friend of mine always takes her family to their favorite vacation spot (sometimes Hawaii, sometimes elsewhere) the week before school starts in September. I asked her why she did that, and she said that when the kids go to school the very next day, they never complain that their summer was boring :). In fact, they are eager to start school and feel refreshed! I found that very clever. Perhaps it is the same for Spring Break? This looks so relaxing. We do the same kind of thing for three weeks in the summer (in Vermont) and it really is so good for the soul. I think it's really great that they meet up with other families. Looks like a great spot. Would love to go for windsurfing. Fun! Love the first picture. 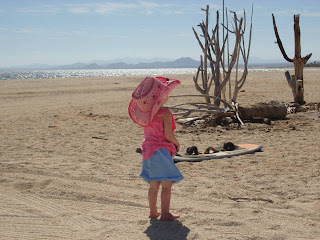 Camping by the beach is my favorite, and a beach in baja, even better. I love that first shot. This looks so relaxing and fun! Never saw solar powered campers! I do think I'm with you on the maybe making the trip down to the campsite for a s'more!